Before there were yuppies, there were uppies—the term Up With People members use to refer to themselves. Most Americans over the age of 35 are vaguely familiar with Up With People, as its cast members have sung to more than 20 million people worldwide, and at the height of the ensemble’s fame, it provided the halftime entertainment at four Super Bowls (1976, 1980, ’82, ’86). But many are unaware of the group’s cultish utopian ideology, its political connectedness, and how it was funded by corporate America, part of a deliberate propaganda effort to discredit liberal counterculture in the 1960s and ’70s. Up With People emerged from the controversial religious movement Moral Re-Armament (MRA)—a cult-like organization that preached honesty, purity, unselfishness and love—so it’s no surprise that the groups bore more than a passing similarity. In fact, Up With People founder J. Blanton Belk was heir apparent to Peter D. Howard, a British journalist who succeeded Frank Buchman as MRA’s leader in 1961. But Belk broke away to incorporate Up With People as a non-profit after President Dwight Eisenhower urged him to distance himself from the dreary image of MRA. It’s no surprise that President Eisenhower encouraged and supported Belk. As Mark Crispin Miller—professor of media ecology at New York University—notes during Smile, “The sixties were a time when a lot of longstanding pieties were being seriously questioned…. Students marched and there were race riots and we saw the first upsurge of feminism. This was …extremely worrying to the powers that be,” he says. It also explains why Eisenhower (and later President Richard M. Nixon) was thrilled to see Belk sending throngs of clean-cut, short-haired kids out into the world to sing upbeat, positive-minded songs, thereby countering the protest movement. “What we did was give young people a chance to express their views through music,” says Belk in a sequence from the film. It was a clever appropriation of the same vehicle—music—that had been embraced by demonstrators who opposed the Vietnam War and the establishment. But the financial lifeblood of Up With People was corporate America, which recognized that it could use uppies to promote a business-friendly image. 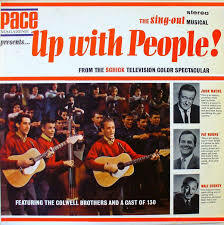 Patrick Frawley Jr., a right-wing evangelical who owned Schick, was one of the group’s biggest supporters; he purchased television time and underwrote the first Up With People album, which had John Wayne, Pat Boone and Walt Disney on the cover. But Schick was hardly alone among multinationals. Companies like Exxon, Halliburton, Coca-Cola, Pfizer, General Electric, Coors, Toyota, Enron and Searle donated tens of millions of dollars to the organization, keeping it afloat until 2000, when George W. Bush became president and evangelicals could declare that their ideological war had been won. The propaganda effort aside, individual members of Up With People certainly fomented their share of positive change, or at least spread good cheer wherever they went. In fact, most were just having a good time performing and traveling the world, oblivious to the agenda of the organization’s leadership and financial backers. “The members of the cast were like puppets. They never stopped to think about where the funding came from, or that someone had to open doors for them,” reminds Storey. Anyway, in some respects the group was surprisingly progressive. Up With People not only accepted members of all races and cultures, but deliberately placed minority cast members with Caucasian host families whenever the ensemble rolled into a new town. Up With People didn’t lose its way because it lost the ability to control its cast members’ behavior, or because the public suddenly came to recognize that its sickly sweet songs were insufferable. Up With People declined because it became irrelevant, especially after the Cold War ended and American corporations no longer felt compelled to send groups of singing young people overseas, hoping to sweep in behind them to do business.